1873 was the year that gave rise to the Morgan Dollar. The immensely popular coin came out of the Bland-Allison Act of the same year. The act required the U.S. Treasury to purchase an amount of silver then introduce it into circulation in the form of silver dollars. The amount to be purchased was between $2 and $4 million, largely from western mines. There were several motivating factors for the act. First, mines were yielding enormous amounts of silver. The output was beyond industrial needs at the time. Second, Germany dumped 8,000 tons of silver into the open market after converting to the gold standard. In time, minting Morgan dollars became representative of the free-silver movement. This economic policy advocated the unlimited coinage of silver into money. Many of those supporting the free-silver movement subscribed to the concept of bimetallism. Under this system, the value of a monetary unit is based up its equivalent in gold or silver. The Bland-Allison Act, however, was deeply unpopular with then-president Rutherford B. Hayes who had a personal financial stake in the banking industry. Though he vetoed the bill, Congress overturned the decision, and the act became official. Hayes, however, was able to limit the scope of the act by choosing to purchase minimal amounts of silver. It was a period in U.S. history when bimetallism appeared to be on the rise. However, problems occurred amid fluctuating amounts of mined silver. That is, as miners sourced increasingly large deposits, more silver entered the market eventually decreasing silver prices. The Morgan dollar is truly unique. In fact, some argued it was too unique. The American eagle on the reverse side of the coin showed eight tail feathers. This caused a stir because all previous U.S. coins had an eagle with an uneven number of feathers. Surprisingly, the public pressure was enough to motivate a redesign. The mint would change the feathers from eight to seven. The change occurred fast because only one city - Philadelphia - minted Morgan coins. Officials collected all of the dies and restruck them with seven feather dies. As a result, some of the first new “corrected” coins had seven feathers on top of eight before the mint created entirely new, eight feather dies. Meanwhile, several of the 1878 eight feather Morgan dollars remained in circulation. Meanwhile, the U.S. Treasury continued to purchase 140 tons of silver each month to mint coins. They made payments to the silver miners in gold. The U.S. Treasury amassed a towering stockpile of silver and, at the same time, gold stores were depleted. Before long the Treasury faced the possibility of default which ignited panic across the country. The resolution to all of this was the Sherman Act of 1893 which halted the Treasury’s gold purchases for silver production. 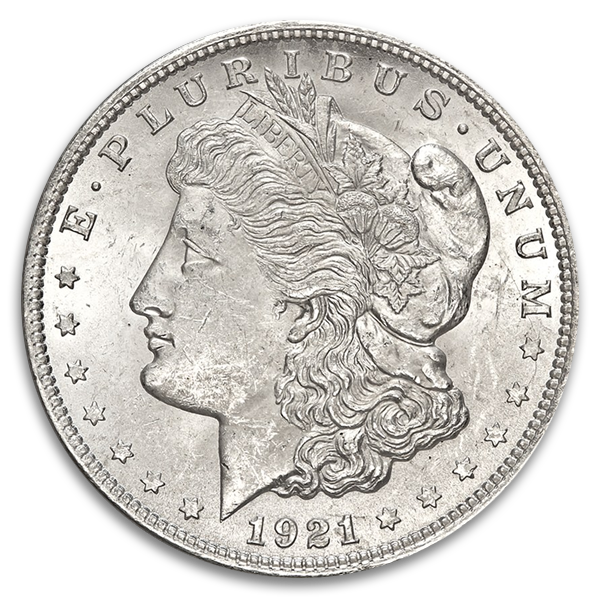 Mints ceased production of the Morgan Dollar. Then in 1921, they brought it back. The production lasted less than a year. Then they were done for good. The Morgan dollar was ready to fade into history. Until 1960 when a surprising find was made. The government executed a plan to account for all silver dollars in storage. In a dusty backroom of the main Treasury building in Washington was a forgotten hoard of uncirculated Morgan dollars totaling $2.8 million. Given the long-held demand for Morgan dollars, the government packaged the coins and sold them. It’s reported that during the final sale in 1980 more than 200,000 orders of the 400,000 received were turned away. The demand far outpaced the find. Today the Morgan dollar is the most collected and coveted silver dollar in existence.